If you were to name the one thing you have the most compassion for, what would it be? Animals. Just to let you know, it's really hard to pick just one thing. It's been said that, "The best things in life are free." Do you think this is true? Yes. It certainly helps to have some money for basics and a few luxuries, but love, friendship, nature... all those things are free. I adopted your "Manic Monday" to my blog earlier this week. Thanks for that link. 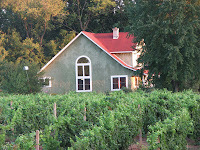 Your house looks so cute in amongst the grape vines.